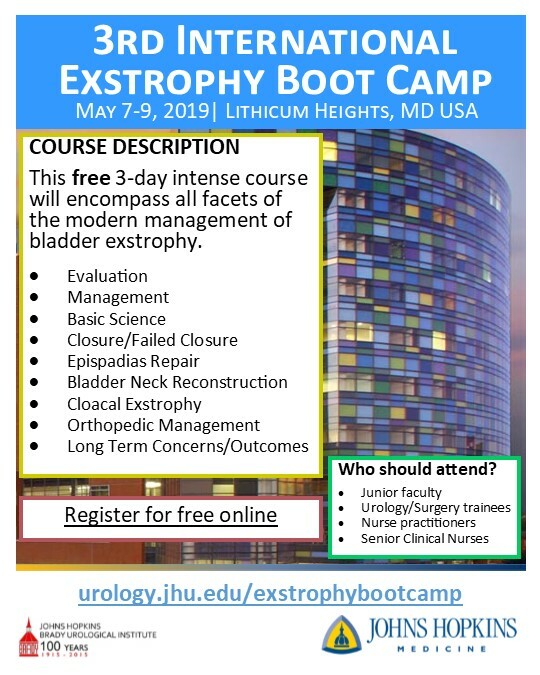 The Brady Urological Institute, Division of Pediatric Urology, Johns Hopkins University will be hosting another Bladder Exstrophy Boot Camp this coming May 7-9. This will be a three-day intensive course, which will review all facets of the modern approach to the evaluation and management of bladder exstrophy, cloacal exstrophy, and epispadias patients. Importantly, registration is completely free! This course promises to be one of the most comprehensive events to ever focus entirely on exstrophy. Newcastle Surgical Training Centre, Freeman Hospital, Newcastle upon Tyne. To view more information, please click here. The Taiwan Urological Association (TUA) will hold its 6th annual International section of Taiwan Urological Association Conference (ISTUA), which is taking place in Taichung, Taiwan on August 17th, 2019. TUA welcomes original abstracts from investigators in the urology community. Submission will be accepted from academic institutions, teaching and community hospitals, or industry. Both TUA members and non-TUA members may participate. The deadline for abstract submission is March 31th, 2019, 11:59 PM Taiwan Time. First authors can expect to be notified of their abstract by mid-May 2019. Abstracts will be evaluated using a peer review process. Urology research faculty from TUA members will serve as peer reviewers to approve research to display at the Podium or Poster Session. You can also be part of this world class programme - submit your abstract by April 1, to present your research at the premium continence and pelvic floor dysfunction meeting! SIU Members can access The World Journal of Urology through the Members only section. Non-members can access The World Journal of Urology website for general information. Starting in January 2015, The World Journal of Urology will be the SIU’s official monthly journal. Through this new partnership, we will promote a continuous flow of highquality publications to the Journal, and stimulate submission from SIU members around the world. The Journal is circulated electronically to all SIU active, senior, affiliated and associate members. Trainee members can subscribe for an additional US $25 per year. Members may opt for print subscriptions, for an additional US$20 (plus US $45 shipping and handling) per year. uCARE is the Société Internationale d’Urologie’s official Office of Research, created in the fall of 2017.
uCARE uses an intuitive, web-based platform, for global clinical research in urology. The first of its kind in the field of urological clinical research, uCARE connects urologists and patients to clinical studies and registries being conducted around the world. Our research is powered by a global council made up of one representative from each of the SIU’s group members and/or global urological partners. This sets the stage for urological societies to connect and collaborate with each other on research activities, through established research centers in each participating member country, with the aim to unite, strengthen and advance urological care for patients.